As Ohio seems to have gotten a severe fast-forward into fall, I am resigned to the fact that grilling out is going to be few and far between. Although, my parents grill in the dead of winter in Michigan (and shovel a path to their grill! ), so I am not saying it cannot be done. But, I will admit our grill gets used a bit less frequently, especially when I would rather cacoon inside and smell up the house with spices and tantalizing goodness. But, a few more grilling recipes will be showing up as stragglers – ones I really wanted to try this year and just couldn’t bear waiting until next spring. Needless to say, they would become hidden in my folder of “must tries” and then get shoved aside for the new recipes that Bon Appetit or La Cucina Italiana says I must make in spring 2011. The stuffed tomatoes were a far cry from what the original recipe said. I couldn’t find robiola in my local store (although I have run past 2 recipes since then requiring it, so I will need to find a supplier quick! ), so I substituted creme fraiche. I am sure another cheese would be better – something less the texture of creme fraiche and more the texture of, well, robiola. 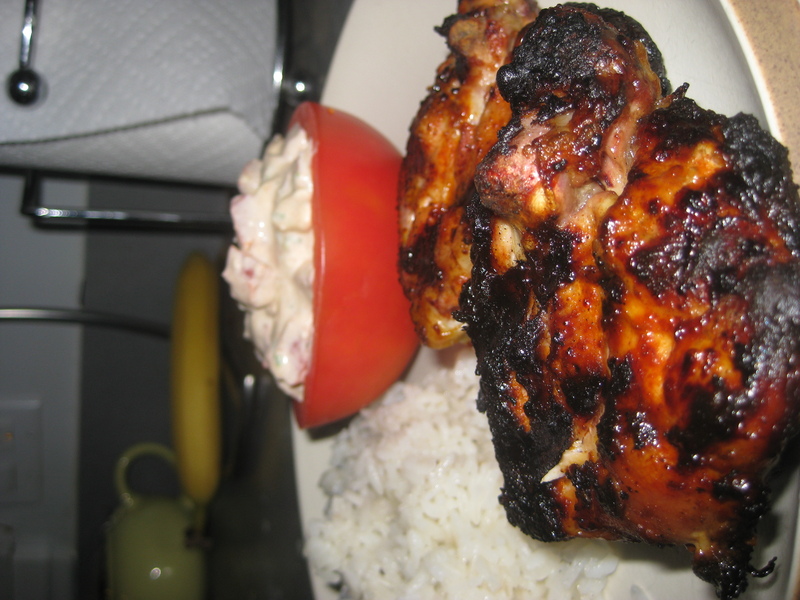 But, it turned out really nice and refreshing, and cut the smokiness of the chicken perfectly. So, don’t give up on your grill quite yet -there is no snow to shovel, just leaves to sweep out of the way. Seems a small price to pay for a fantastic dinner! Build a fire in a grill with a cover, leaving about ⅓ of the grill free of coals. If using a gas grill, make sure one side of the grill is unheated, and either swap out the paprika above for the smoked version known as pimenton de la vera or wrap two small mounds of moistened wood chips in heavy aluminum foil and pierce the tops of the packets with the tines of a fork. In a bowl, combine the paprikas, honey, lemon juice, garlic and butter and stir to make a paste. Season the chicken with salt and pepper, then coat thoroughly by hand with the spice paste. Place chicken on cooler side of grill and cover. If using wood chips, place the foil packets, pierced side up, on the hotter side of the grill and cover. Roast chicken for 15 minutes, turn, cook for 10 to 15 minutes more, or until cooked through. Serve hot, warm or at room temperature, with lemon wedges, sprinkled with mint leaves. Halve the tomatoes and scoop out the seeds and some of the flesh. Sprinkle the shells with kosher salt and turn them upside down on paper towels to drain for 30 minutes. Place the robiola, gorgonzola and butter in a bowl, season sparingly with salt and aggressively with pepper, and beat until smooth. Fill the tomatoes with the mixture. Place on serving dish until ready to serve. Serves 4. Adapted from “Recipes From an Italian Summer,” by the editors of Phaidon Press. When I saw this recipe, I’ll be honest and admit I wasn’t sure exactly what Peruvian food entailed. Latin American, yes, but each country always has its own influence, its own specialty and its own regional cuisine. After my two weeks in Italy, I learned that even two regions in the same country are rarely alike. So when I saw lime, cumin, paprika – I nodded my head. Sure, those all made sense. But then I saw soy sauce….huh? Apparently there are many large Japanese and Chinese communities in Peru, and hence they have influenced the cuisine. Seemed like an odd combination so I thought I would try it out. I don’t know if it was the 24 hours in marinade, the slow cooking on the grill (you leave it on longer on the side without a burner on) or the flavorful combination of ingredients, but it is amazing! Very juicy, great taste, and a perfect, easy grilling meal. I served it with some Spanish beans and it made for an easy weeknight dinner (just don’t forget to throw it in the marinade the day before). Thanks to Gourmet for this great keeper! Blend soy sauce, lime juice, garlic, cumin, paprika, oregano, 1/2 teaspoon pepper, and oil in a blender. Put chicken in a large sealable bag and add marinade. Seal bag and marinate, chilled, 8 to 24 hours. If using a charcoal grill, open vents on bottom and lid of grill. Light a large chimney starter full of charcoal (preferably hardwood). When coals are lit, dump them out along opposite sides of bottom rack, leaving a space free of coals (the size of the quartered chicken) in middle. When you can hold your hand 5 inches above the grill rack directly over coals for 3 to 4 seconds, coals will be medium-hot. If using a gas grill, preheat all burners on high, then reduce heat to medium-high. Discard marinade, then pat chicken dry. Oil grill rack, then grill chicken over area with no coals (or over a turned-off burner), skin side down first, covered, turning over once, until cooked through, 30 to 35 minutes (add charcoal to maintain heat). 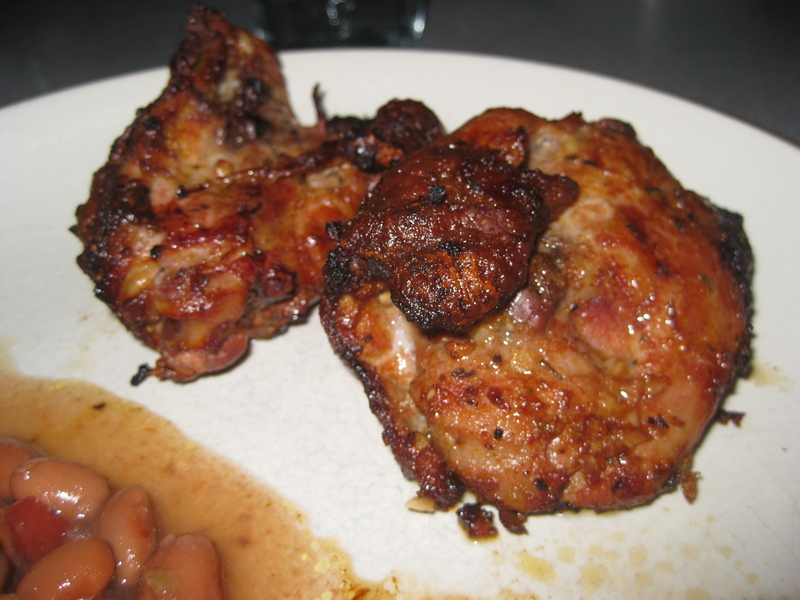 My husband isn’t too big on chicken thighs – every once in a while he is in the mood, but always feels like they are a bit greasy (which is, of course why I love them!). But, I had never tried grilling them, and wondered if the outcome would be different than an oven or a pan. The skin gets crispier on the grill (with less grease, since it drips into the grill) and the meat is incredibly moist. My husband loved them. So while chicken thighs cooked in the house will remain limited, I will certainly be learning more chicken thigh recipes on the grill. This recipe is from Cooking Light and is considered an “Australian Beach Recipe.” The five-spice (a Chinese spice) gives its unique flavor and the mirin and ginger continue to emphasize the Asian flavors. However, the chicken itself has a unique flavor, unlike most Asian chicken I have made. Don’t miss out on the side dish either – it goes perfectly with the chicken. It is the perfect summer meal. Combine first 6 ingredients in a large zip-top plastic bag. Add 1 1/2 teaspoons oil and chicken; seal. Marinate in refrigerator 2 hours, turning bag occasionally. Cut potatoes in half lengthwise; cut each potato piece in half crosswise. Add potato wedges to a large pot of boiling water; reduce heat, and simmer 5 minutes. Drain. Combine potatoes, 1 1/2 teaspoons oil, and 1/4 teaspoon salt. Remove chicken from marinade; discard marinade. Sprinkle chicken with 1/4 teaspoon salt and black pepper. Arrange on a grill rack coated with cooking spray; grill 8 minutes on each side or until done. Remove from grill; keep warm. (Discard skin before serving.) Arrange potato on grill rack; grill 4 minutes on each side or until done. Heat remaining 1 tablespoon oil in a large skillet over high heat. Add yellow onion; stir-fry 1 minute. Add bell peppers; stir-fry 2 minutes. Add tomato sauce and vinegar; cook 1 minute, stirring constantly. 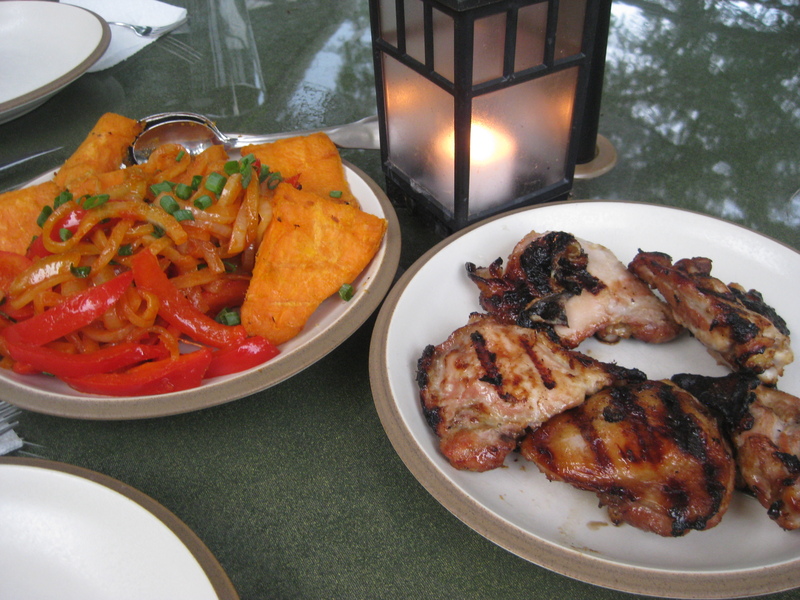 Serve bell pepper mixture with chicken and potatoes. Top with green onions.